I was as surprised as anyone by the victory of Donald Trump over Hillary Clinton. Like many other independent analysts, including most recently Julian Assange (below video), I had been certain that the establishment would not allow a Trump presidency to happen. For sure, the power elite closed ranks and did everything possible to ensure a victory for Clinton. 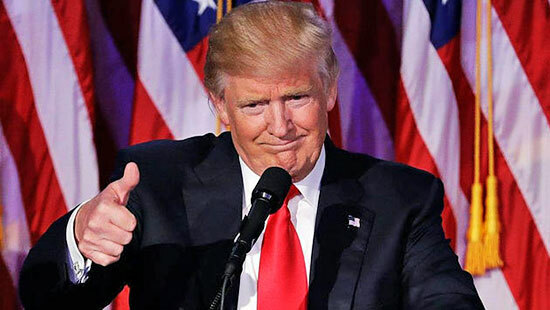 If nothing else, I had concluded that the media alone had done a sufficient job of demonizing Trump – multiple negative headlines daily for more than a year – to make him unelectable to the American people. It reminded me very much of the concerted media attack against Brazil’s Dilma Rousseff which culminated earlier in 2016 in her impeachment and removal from power. In the case of Rousseff, we see what has been alternately described as a soft coup or a Wall Street coup, rather along the lines of the “color revolutions” of a few years earlier (which are now largely understood as CIA-NGO orchestrated). In both cases, pretexts were created and hammered home by an insistent media that whipped up public opinion. In Brazil, it worked. It seemed like it would work in the U.S. It is important to understand why Trump was demonized. To be sure, his character makes it easy. There is no shortage of narcissistic, sexist, or otherwise offensive statements in his repertoire from which to draw. But I have never and will never believe this is why he was demonized. Ultimately, Trump is a disruptor, and his disruption falls squarely against the two key pillars of the American ruling elite’s ideology: neoliberalism and neoconservatism. …and everything else worth owning in this world. This is because, at least in his rhetoric, Trump showed that he is not a reliable globalist or empire-builder. What George W. Bush did to Iraq, Obama and Clinton (and Cameron and Sarkozy) did to Libya, leaving it in a smoking heaping ruin from which it may never recover in our lifetime. As an aside, I remain astonished at my self-described “progressive” friends who consistently overlook the obliteration of Libya, all based on lies and greed. The wreck of that nation will forever be a black stain on the careers of Obama and Clinton, and on the legacy of the United States as a whole. For Trump to speak out about these wars, as incompletely as he did, nevertheless took political courage and he was right to do so. He spoke out forthrightly against the perfidious TPP and TTIP, agreements which go far beyond “free trade” and truly hand over national and local rights to transnational corporations, seemingly for all time. Trump also never signed on to the obscene anti-Russian hysteria promoted by Clinton and the entire rest of the national security establishment, whether they be Democrats or truly insane members of the Republican party like John McCain or Lindsey Graham. And, despite his obvious lack of deep understanding of the problems concerning Syria and the rest of the Middle East, he has at least shown a willingness to work with the legitimate (and secular) government of Bashar al-Assad in fighting the jidahists that have overrun that country. It is true that rhetoric is one thing and action quite another, but Trump’s rhetoric alone placed him in a position diametrically opposed to everything the past several war-making presidencies have stood for. It is interesting now to see riots developing across the U.S. in response to the Trump victory. Predictably, they seem to be led by young people who, as is always the case with the U.S.-CIA-NGO model of color revolution, are the most easily manipulated. A year of CNN demonization has convinced them that Trump is the next Hitler, and they are acting accordingly. While Trump has said a number of things that do not sit well with me and other civil libertarians, I repeat what I have said elsewhere. If you are concerned about fascism coming to America, don’t look for a fist pounding demagogue. *That is fascism, and the U.S. has been living that bipartisan nightmare for 15 years. Thank you George W. Bush. Thank you Barack Obama. Trump might make that situation worse, or he might not. But without a doubt his rhetoric has spoken directly to those who feel left behind by globalization, to a middle class that has been effectively disemboweled over the last generation, in which economic hope has all but evaporated. Trump has played to that part of the electorate, and only time will tell whether or not he is sincere, or can deliver. An interesting sidelight to the recent presidential campaign has been the discussion around Hillary Clinton and her campaign manager John Podesta, and their relationship to the UFO phenomenon, specifically the matter of “disclosure.” That is, whether or not President Hillary Clinton would disclose the reality of the UFO phenomenon to the public if she were elected. To those people not following this, such talk might seem crazy nonsense. But it is true that Podesta has long discussed his interest in the subject and even generated a New Year’s tweet about wanting #disclosure. More recently, we learned via Wikileaks that rock star Tom DeLonge had been communicating with Podesta, introducing him to several prominent generals and members of the aerospace community regarding the UFO reality and even possession of ET technology. The leaks do not give a strong indication of Podesta’s attitude, except that he seemed at least moderately interested. Regarding Hillary herself, we all remember her appearance on the Jimmy Kimmel show when she briefly talked about the subject, even correcting Kimmel on nomenclature (UAP, not UFO), before continuing lamely about maybe going to Area 51 to see what it’s all about. All this sparked a great deal of discussion among some people following all this. My friends and colleagues Steve Bassett and Grant Cameron in particular were of the opinion that Hillary (or even Obama himself) might disclose the truth about UFOs soon. For my part, I never held this opinion and never hesitated to say so. I have never seen a motivation for such a politically experienced operator as Podesta to want true disclosure. As my co-author and I concluded in our study A.D. After Disclosure, this subject is too radical for any politician to handle. At least not without some crisis that might force their hand. I never believed they would ever disclose – unless, I suppose, as an extremely partial and selective disclosure designed in some way to further the political ends of supporting their neoliberal-neoconservative vision. And if that were the case, count me out. I’d rather live with the aliens. But all this talk about Hillary and Disclosure is now moot. It’s never going to happen. What then, about The Donald? I am not aware of any major statement Donald Trump has made about the UFO subject. I don’t know whether or not he takes it seriously. But we need to realize that 2016 is not 1996. Talking about UFOs is not the kiss of death it once was. Times are changing and for all I know Trump just might bring it up. Because Trump is so much more disruptive to the established order than Hillary Clinton could ever be, I might just think he would be more likely to entertain the ultimate disruption of UFO disclosure. At the very least, he would seem more likely to surprise us than she would. For my part, I don’t expect UFO disclosure coming from the U.S. government any time soon. While I personally believe in the value of speaking the truth on this matter – and in my judgment there is no question that the phenomenon is real, serious, and a matter of national security around the world – I don’t see sufficient motivation coming from Washington for some time. There is still too much for the power elite to lose. I remember eight years ago several opportunistic individuals were stating their conviction (or alleged inside knowledge) that Barack Obama was going to disclose the UFO reality. I never for a moment believed that, and I don’t for a moment believe the Clinton faction, or most likely the Trump faction, would ever willingly get aboard the Disclosure Train. Having said all that, we live in revolutionary times, technologically, socially, economically, and now politically. Our world is in flux and in such a situation, things can happen unexpectedly. The Trump victory means that the neolib-neocon establishment is on the back foot for the moment. Don’t expect that to last too long, unless a miracle occurs and the Trump administration actually moves against them. I’m not counting on it, but then again some people like to buy lottery tickets. Odds seem about the same to me. The reality is that the U.S. is a global empire that is resisting with all its might the inevitable development of a multipolar world. That brings great danger, and a lot of crazy people inside Washington who think they can stave off the inevitable. Those people had the ear of Bush, Obama, and Clinton. They were and remain very dangerous. They are still in the U.S. government and will be there to greet President Trump. The question of UFO disclosure is merely one of many treacherous issues that the coming four years will see play out.